As expected OPEC keeps its production output at 30 million barrels per day. With its market share protection strategy working, OPEC decided on Friday to maintain its current output ceiling at 30 million barrels per day. It is a move that has largely been expected by the market since the policy has had its desired impact -- U.S. oil production is poised to decline while global oil demand growth is starting to heat up. That's a recipe for mildly higher oil prices, which will increasingly fall into OPEC's coffers as it starts to take market share from the U.S. and other higher-cost oil producers. When OPEC decided not to cut its oil production last November after rising crude supplies were met with tepid demand, it sent shockwaves through the oil industry. That decision accelerated the oil price decline, causing prices to bottom out at around $45 per barrel. That steep drop in oil prices forced the market to respond when OPEC chose to keep pumping oil out close to its capacity. That response came largely from U.S. oil companies, which laid down rigs at a record pace. Prior to this June's OPEC meeting, the U.S. oil industry cut its rig count every single week for 25 consecutive weeks, according to data from Baker Hughes (NYSE:BHI). That resulted in a dramatic drop in the U.S. rig count, as noted in the chart below. 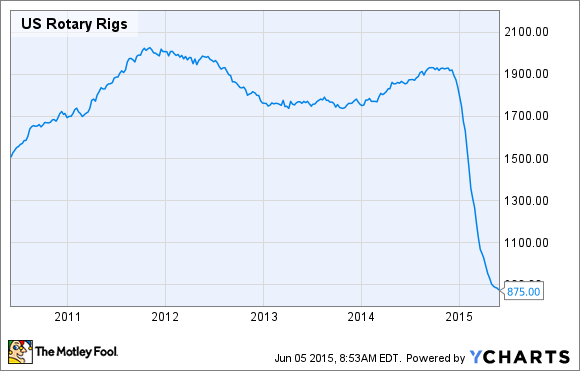 Overall, the rig count is down 60% from the peek and is now at a level not seen since January of 2003. With less rigs drilling, it is widely expected that U.S. oil production will begin to decline in the second half of 2015. That projected decline is largely behind the big rally in oil prices off the bottom. Further, this projected decline is why oil prices have been largely tame over the past week after it became evident that OPEC wasn't going to give any ground on production. Aside from knocking rival producers out of the market, OPEC's other main goal has been to spur new demand. Persistently high oil prices over the past few years has cut into demand for oil. High oil prices have not only curbed demand, but have also spurred investment into energy efficiency. However, lower oil prices as of late are beginning to refuel demand for more oil. For example, gasoline demand in the U.S. is starting to pick up and is well above last year's demand, as noted on the chart below from the U.S. Energy Information Administration. Even more broadly, worldwide demand for oil is expected to accelerate in 2015 as a result of lower oil prices. The International Energy Agency's current forecast is calling for 1.1 million barrels per day of additional demand for oil in 2015, bringing the daily average up to 93.6 million barrels per day. That demand growth is much higher than 2014, when demand only rose by 700,000 barrels a day. That increase was much less than expected and was one of the big factors in the crude oil collapse in the back half of the year. With OPEC pumping out as much oil as it can, it will still take some time before supply and demand are in balance. However, given the dramatic drop in the U.S. rig count and the acceleration in demand for crude, the signs are apparent that the market is self-correcting. Because of this, OPEC's view is that oil prices will continue to rebound, even without its help. However, most members now think that a return to triple-digit oil prices are off the table for quite some time. Instead, the largely held view of OPEC members is that $75 per barrel is what the market should expect to see by the end of this year, with some members calling it the new "fair price" for oil. 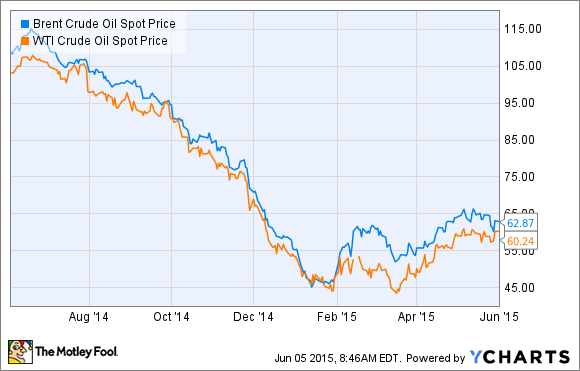 That price suggests there is some upside left, as oil has been around $60 per barrel of late. However, it remains to be seen if that price doesn't lead to a reacceleration of U.S. oil production, as shale costs have fallen so dramatically that $75 could very well be the new $100 for shale economics.